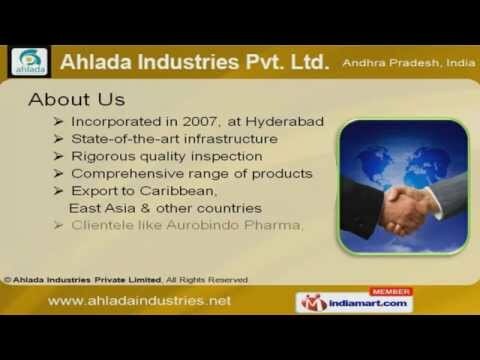 Ahlada organization is named as one of the most recognised and trusted name in the field of manufacturing and exporting out a huge range of sturdy and precision Pharma Equipment. In the involved business operations, we Ahlada Industries Private Limited,are greatly assisted by cutting-edge process technologies and infrastructure set up including the use of modern machinery & equipment that allow us to ensure flawless design and construction standards in the offered product range. With our expertise, we are involved in offering our clients a wide assortment of storage systems and process machinery equipment, so that we can meet our customers demand on time. We offer huge selection of Pharma Equipment like Industrial Storage Systems, Heavy Duty Systems, Cable Trays, Vacuum Dryers, Industrial Storage Tanks, Pharma Equipments, Jacketed Reactors, Industrial Blender, Nutsche Filter, Heat Exchangers, Industrial Pallets, Pallet And Pallet Cages, Jacketed Reactors, Industrial Dryers and much more. We are committed to follows stringent quality norms by maintaining high quality raw material, periodic in-process inspections and itemized reporting. We are also quite flexible with 3rd party quality inspection which allows our customers to have quality inspected here at our manufacturing site itself. Some of our high reputed clients are: Aurobindo Pharma Ltd Jubilant Organosys Ltd Teva API India ltd Dr. Reddyâs Laboratories Ltd Biocon Ltd Nicolas Piramal India Ltd Karvy Hetero Reliance Industries Ltd Due to the strong and continuous effort of the company, we have successfully achieved the trust of elite clients worldwide, and are proud to be among very few vendors to be given the green channel route of supply.